Asian markets ended higher in the morning sessions after a 0.6% growth in China’s Aug leading indicator boosted confidence that its economy is not entering into a hard landing. However, the gains erased in late trading as European markets opened lower. After recoding cumulative losses of 69 points in the last eight sessions, the FBM KLCI inched up 8.4 points to 1410.6 but trading volume decreased to 708 million shares worth RM1.16 biilion against Tuesday’s 785 million shares worth RM1.42 billion as broader sentiment remain cautious ahead of the conclusion of the 2-day FOMC meeting. Leading movers were SIME (+33 sen to RM8.24), CIMB (+5 sen to RM6.89), GENM (+8 sen to RM3.50), AMMB (+10 sen to RM6.11) and AXIATA (+3 sen to RM4.69). In the wake of the overnight sharp falls in U.S. and Europe markets, the technical rebound momentum from yesterday is likely to be under threat. Persistent foreign liquidation activities are likely to continue and depress our market in the short term. Critical level to watch is the 1400 psychological support as a break below will trigger further pressures towards 1367 points (61.8% FR from peak 1597 and low 1224). 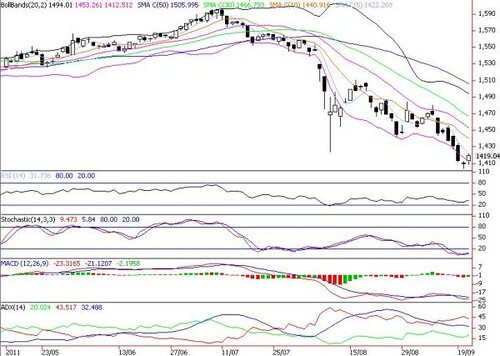 Any technical rebound is likely to face tough hurdles near 1441 (10-D SMA) and 1453 (mid Bollinger band) points.